Pakistan have been very dominant in this first Test, which sums up the series so far and are on the verge of victory at the end of day 3 in Abu Dhabi against New Zealand. They have been exceptional, be it their batting, bowling or fielding. The star for them in the match have been Yasir Shah and Hasan Ali both picking 8 and 7 wickets. On the other hand, New Zealand haven't had anything much too cheer for. They are on the verge of losing the Test match after a poor batting display by their lower middle order. Jeet Raval, Henry Nicholls and BJ Watling had set the ideal platform to post a target in excess of 200 but the lower middle order failed and that wasn't quite possible as they were bowled out for 249. 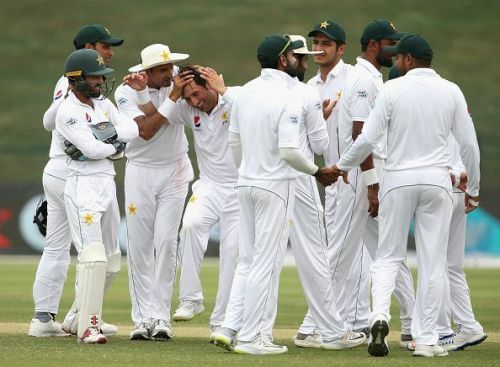 They were threatening to set a much bigger target, mainly thanks to a 112-run partnership for the fifth wicket that saw Pakistan endure a wicketless afternoon session. Henry Nicholls brought up his sixth half-century in Tests, and BJ Watling his 15th in a defiant partnership that was cautious at the start and saw only 66 runs being scored in the 30 overs after lunch and all Pakistan could muster were a couple of close shaves at short leg off Yasir. A lot of credit goes to Yasir Shah and Hasan Ali. The former's dream dismissal of Kane Williamson, when he was bowled trying to defend, set things in motion early. Ross Taylor's counterattacking innings, which saw him hit Yasir for three boundaries in an over, was put to an end by Hasan Ali, who picked Jeet Raval's wicket in the same over in an attractive display of reverse swing. Yasir was the man once again who provided them with the breakthrough after a brilliant stand for the 5th wicket. Yasir Shah nipped all of them off one by one, before Hasan Ali came back to clean up the tail to keep the lead to 175. From being 220 for 4, the visitors slipped to 249 all out. On the other hand, Imam and Hafeez came out all guns blazing - the latter more than the former. With just 139 runs needed Pakistan are on course for a deserved victory. For New Zealand to win the match the need to pull off something very special and they will pin their hopes of Trent Boult, who was the leading wicket-taker in the first innings.